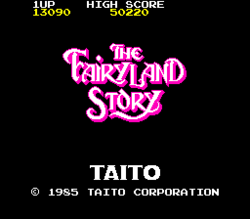 The Fairyland Story is a platform arcade game, which was released by Taito Corporation in 1985; it utilizes two Zilog Z80 microprocessors (one running up at 5.3665 MHz and the other at 4 MHz) and a Motorola M68705 sub-microprocessor (running at 2 MHz), with a General Instrument AY-3-8910 and OKI MSM-5232 (running at 2 MHz) and DAC for sound. The player must use a 2-way joystick to take control of a young witch known as Ptolemy, with a button to make her turn a variety of enemies (including wizards and witches), into cakes, then push them off the edges of the platforms to kill them - however, if any enemy should touch Ptolemy, they will trap her in a bubble and she will fly away (costing her a life). This game can be seen as a precursor to Taito's own Bubble Bobble (1986) and Don Doko Don (1989), which serve as the basis for the third, and ninth, stages in the "Parody Mode" of Space Invaders DX (1994), and this game also served as the basis for the second stage; it was later ported to the MSX in 1987 by Hot-B and to the Sharp X68000 on September 27, 1991 by OeRSTED (however, the conversion was done after Taito changed their logo in 1988, so it has their then-current "triangular" logo on its front cover, as opposed to their "serif-text" one seen on the original's title screen and MSX version's front cover). This page was last edited on 21 March 2017, at 19:41.